What do you mean by ‘human interface’? The interface is only attached to the machine today for pre-digital constraints that no longer apply. We move the interface away from the machine towards the actual entity that counts in all of this; you. 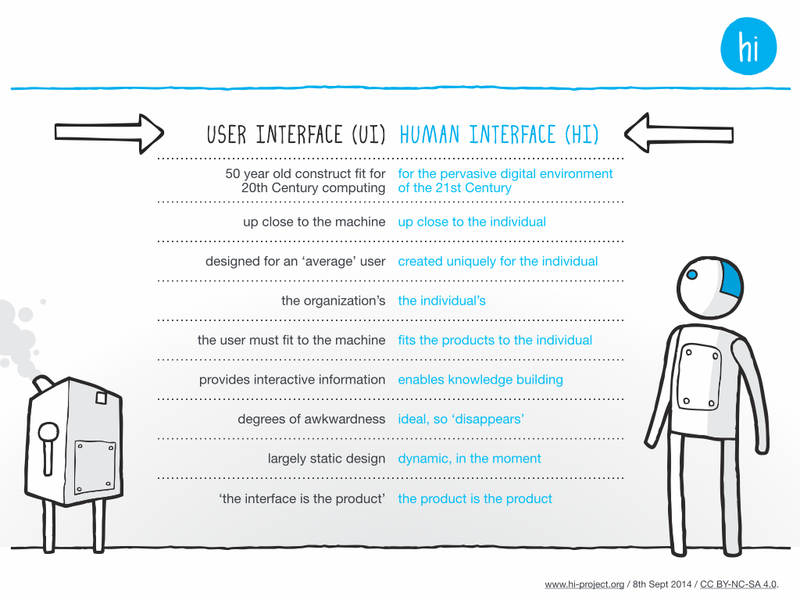 This graphic explains human interface by comparison with user interface. It’s repeated below in text format should you have a small screen or use a screen reader. Behind every digital interface is data and the transformation of data. Data of itself is just discrete, objective facts, and we mere humans do not readily digest or understand data. Rather, we deal in information; that is data made useful, made relevant. A collection of data is not information – for that it also requires context and understanding. And that context and understanding often comes from considering one set of data amongst others. So ownership of data is best viewed differently to ownership of non-digital things if we’re to make the best of it. It’s also worth noting here that a collection of information is not knowledge. Knowledge is acquired from identifying and interpreting patterns in information, and is a primary objective for human interface. The hi:project is intent on navigating this new vista, with respect for the individual taking primacy. This table explains the vista neatly. Source: Unlocking the power of personal data: From collection to usage (PDF, Figure 2, page 7), World Economic Forum. What problems does the hi:project aim to solve for people? Today, people are unsure of and uneasy about the information organizations hold on them, or what sort of monitoring is going on in the background. Clarity and comprehension are thwarted by multiple, inconsistent and too often poor user interfaces, none of which are tailored to our specific digital, numerical, information and visual literacy. And very few adapt to more than a narrow range of disabilities. What’s more, with the advent of the Internet of Things, there are ever increasing things to interface with. And last but by no means least, there’s no way to visualize or understand information spanning organizations. It’s as if your life can only be viewed as a collection of brand oriented siloes. What problems does the hi:project aim to solve for organizations? Organizations view user interface development as expensive and risky, encompassing different devices and different users with different expectations and abilities. They must also build brand trust by being more open, more accessible, and more helpful, particularly as trust brings greater customer loyalty and future revenues. They’re wondering how to deploy new technologies without creating excessive surveillance. Those operating in the EU are concerned with compliance with the pending General Data Protection Regulation. When greater simplicity is offered to organizations today it’s typically accompanied by intermediation – an entity getting between the organization and the people that matter to it, and probably one that puts its own motivations first. What sort of personalization are we talking about? People who do that expect to see advanced tools. People like you love to run regression analyses. Offering up an end-of-month fitness report, ‘as usual’. Can you clarify the emphasis here? This quote from a lengthy exchange with the head of a large technology consulting firm might help convey our emphasis. It is perhaps subtle but integral nevertheless to our philosophy and execution. OK. So you are launching a community. That has a stated aim of developing a personalization engine. Which can in turn be used by organizations to personalize interfaces. And you hope that individuals will come and build your open platform and that organizations will use your platform. Yes? We are inviting people and organizations to join a project, so long as they believe in its purpose and subscribe to the associated values and principles of course. They may be attracted for altruistic, commercial and / or competitive reasons. We will develop a personalization engine and all the methods, rules and components the engine needs to assemble each of the interfaces accompanying all the roles in life. Organizations subscribe to this capability, enabling all the people interacting with them to effectively own and control their own interfaces, often incorporating data and information spanning different organizations. Who’s doing this? Who are the members? Our members are those who can see the value in the project’s purpose and intent and who wish to help make it happen. Our principles state that the project is open and voluntary – we are open to all persons willing to volunteer and accept the responsibilities of membership. You can see the core team that has emerged here, the project’s champions here, and you can become a member yourself here. One of our founding principles relates to autonomy and independence, asserting that what we do is by members and for members. Ownership is a word with a lot of 20th Century baggage. It implies that something is property, but the hi:project isn’t property per se. Rather, it’s a community that exists because its members believe in its purpose, and contribute and derive value accordingly. Its output – software – will be published openly. Is this a for-profit or non-profit? We didn’t realise at first but this is quite an interesting question to answer. Such terminology is predicated on the idea that an organization (and we use that word in its broadest sense here) can only be one else the other. A for-profit organization maintains financial accounts and aims to distribute at least some of the difference between income and costs (ie, profit) to its shareholders as dividends or have its share price go up in value by reinvesting that difference. A non-profit also maintains accounts but doesn’t aim to increase the wealth of any shareholders; rather it aims to sustain its finances to pursue its objectives. The hi:project is a decentralized community delivering a decentralized service built on a decentralized platform. Not being a legal entity in its own right it doesn’t maintain financial accounts, and there is no central entity to receive or pay out money. The hi:project is completely open-source, decentralized and autonomous. If we decide it’s advantageous to raise funds to make faster progress here, then the corporate body that would be required would play its part as a member of the decentralized project. Such a corporate and such financial investment will be entirely open and transparent and align the motivations and responsibilities of directors and the finance provider(s) with members… the investors will just be bringing a different and complementary kind of value to the table on equitable terms to help create mutual value faster than otherwise for members. Funds would, for example, facilitate our developing software sooner than later. What does being a member of the hi:project mean? Quite simply it means being willing to bring your awesome super powers, and more likely your everyday powers too, to help make this happen. We do hope members will subscribe 100% to our principles and values, and indeed this might not be for you if you don’t. Ultimately, being a decentralized community entails self-organization, so being a member accrues meaning from the community participation as much as anything we might write here off the bat. We’d love you to join if you love what we’re setting out to do and the way we’re trying to do it. We welcome developers and designers, rockstars and baristas, retirees and students, and anyone and everyone in one or more of the roles we’re aiming to serve – customer, citizen, employee, employer, patient, family member, etc. In other words, anyone and everyone who can contribute even the teeniest weeniest to making this happen. Saying that, you might not be surprised to hear that we need to focus on getting the core developer and designer teams in place asap.